This is our first year with an Elf on the Shelf. It's been pretty fun so far. The kids couldn't quite agree on a name. Collin wanted John. Lydia wanted James. (BORING Elf names, but I kept my opinions to myself.) Shane helped them compromised on "Jimmy John". "Shane, you know there's a sandwich company called Jimmy Johns." "I guess that's why it sounded good." Anyway, sometime this December we may have to head to "Jimmy Johns" for a Christmas sandwich dinner, compliments of our Elf. 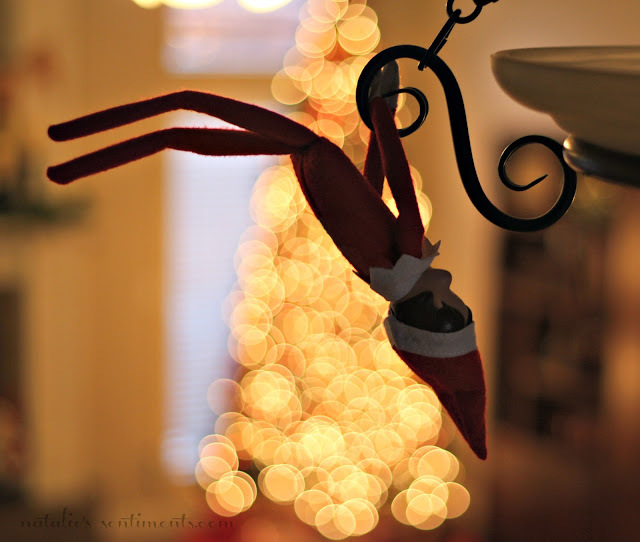 Are you doing the Elf on the Shelf? What name did you pick? Are your kids on better behavior when he's on the watch? We have an elf. His name is Sweet Red ~ also a compromised name. This is our second year, and my girls don't really behave better. They do tattle on each other, reminding the other one that Sweet Red is watching... not very helpful :) Enjoy Jimmy John! We've been having fun with them, coming up with mischievous things for them to do. We just got ours as well... his name is ElfMan (they just watched that movie)... he's a mischievous one, He got yelled at the first night because he ate my chocolate. Hark The Herald Angels Sing. In underwear. Stocking Stuffer for a buck.